Five reasons to visit Slovakia • Where Is Your Toothbrush? I need no reasons to visit Slovakia. It is my homeland and it will always be home (though since I made a new home in Portland, Oregon, and am now considering home to be wherever my toothbrush is, I call Slovakia home-home). Everyone should visit Slovakia just because I’m from there. Yet after seven weeks visiting Slovakia on the Where Is Your Toothbrush? RTW Tour, I realized something: though the number of tourists appears to have increased, my country deserves to get on more maps. Since you are reading this, you are the right kind of person to visit. Here are five reasons to visit Slovakia. Bratislava’s historic downtown is full of tourists nowadays, but the rest of the country is where the capital was 10-15 years ago: a smattering of brave souls passes through, usually on the way between Prague and Budapest. Czechs, Poles, and Hungarians do visit in great numbers, mostly the mountains, but seeing an American is rare. Lonely Planet (followed by The Independent) lists Slovakia among the countries to visit in 2013. That it’s taken this long for Slovakia to make it to such lists is an indication how far it has to go before it gets crowded. In fact, I am skeptical it ever will because 1) the neighboring countries have such a head start, and 2) it’s not as easy to get here. So come on down to the middle of the European continent for mountain paths, museums and historic small towns you can have pretty much to yourself; for wonderful Slovak food and beer that’s more than affordable, especially outside Bratislava; and for the extremely hospitable people (see below). Did I mention beer? 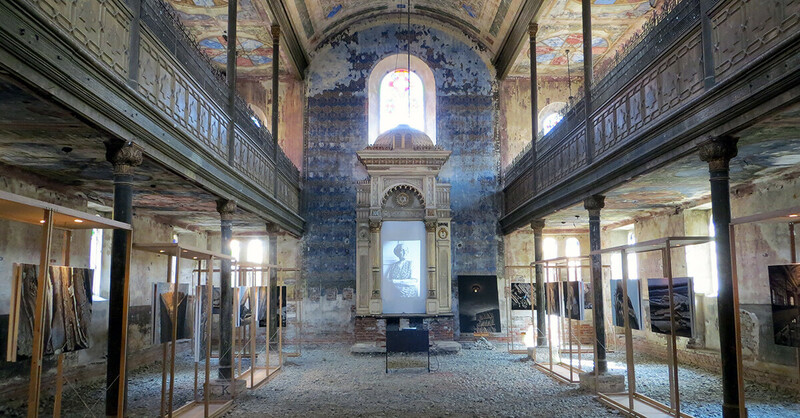 Yuri Dojc’s exhibition Last Folio has been extended due to high demand, but often you can have the decrepit synagogue on Košice’s Zvonárska Street to yourself. No one visits countries based on their marketing slogans. But though Slovakia’s marketing slogan sounds a little awkward in English (as do many other translations on tourist information boards and the like), it is accurate. Little Big Country (see videos below) means Slovakia is small but boasts a disproportionate amount of historic and natural treasures. As an example, consider sights. Though Slovakia covers only 0.033% of Earth’s landmass, it boasts 0.068% of all properties on the World Heritage list—five cultural and two natural (14 more are on the tentative list). As I said, small but dense. As another example, check out this notorious Little Big Country promotional video. In my opinion, there’s too much of Bratislava and golf and too little of the rest of the country, except the High Tatra Mountains and Košice, but it’s a nice introduction nonetheless. A Slovak saying goes, “A guest in the house is a god in the house.” Slovaks love visitors. So much so we can smother them in our hospitality. Only in Slovakia do you arrive to a private residence at 10 pm and get offered a three-course dinner; only here do you get offered food 10 times a day lest you report back home that we didn’t feed you. Only in Slovakia do we greet you and say goodbye to you at the door with a shot of spirits; only here is your glass never empty in between. Befriend a Slovak and all the doors he can walk through open to you as well. A common complaint among both the Slovaks and visitors is service in restaurants and the hospitality industry in general. On this trip I encountered grumpy waiters, unhelpful receptionists, and museum staff who only spoke Slovak. I won’t waste time explaining such realities (mostly they have to do with how little people make and with the cheapskate tipping culture), but I will advise to think of such encounters as cultural experiences. Isn’t perfect service boring? Next, focus on the positive: staff at Chata pri Zelenom plese (Green Tarn Chalet), Buchvald and Egidius Minibreweries, or the aforementioned Kávy sveta/Coffee World can pride themselves in providing excellent service. And the more people follow Reason #1 to visit Slovakia, the higher the demand for better services, and the more commercial hospitality improves over time. It’s a numbers game. Help Slovakia out! In 2013 my hometown Košice is a European Capital of Culture, together with Marseille, France. A ton of cultural events (concerts, exhibitions, festivals, openings) are taking place this year. But the city has been on the up and up for a few years now. 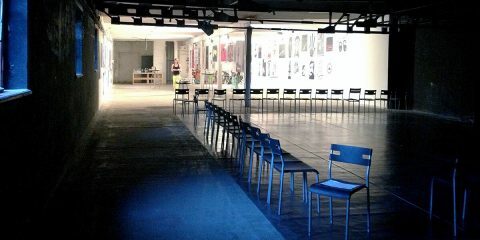 Several old heat transfer stations in socialist housing developments have been converted into culture centers and a number of other world-class spaces have opened; the Street Art Communication festival enlivens blank walls with urban art… The city lives and breathes art (see the Košice 2013 Program). The same is the case in the rest of the country. This summer alone I wished I could have gone to Trenčín (Pohoda music festival) or Banská Štiavnica (activities of the Banska Štiavnica center of contemporary art). Whether this is the result of any Capital of Culture effect I can’t say, but the fact is, creativity in Slovakia is skyrocketing. 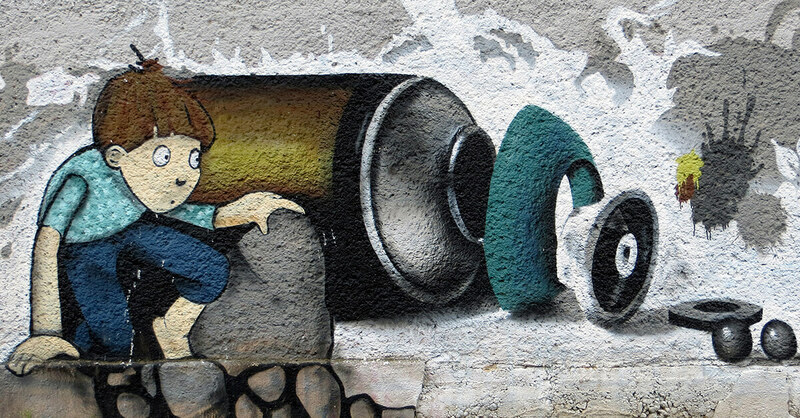 The Street Art Communication festival is in its fifth year in Košice. This is a graffiti mural from 2009 at the Ondavská Street dorms of the Pavol Jozef Šafárik University. Allan Stevo has pointed out that in some ways Slovakia is stuck in the 1950’s: alcohol, lard, and pig killings are appreciated; political correctness doesn’t exist; and people dress up to go out. Socialism is still present, chiefly through architecture that breaks up the monotony of historic buildings. The High Tatra Mountains are still gorgeous. But Slovakia is changing fast. Since only repeated visits best reveal the transformation, I encourage visiting Slovakia often. I travel to Slovakia every 2-3 years. 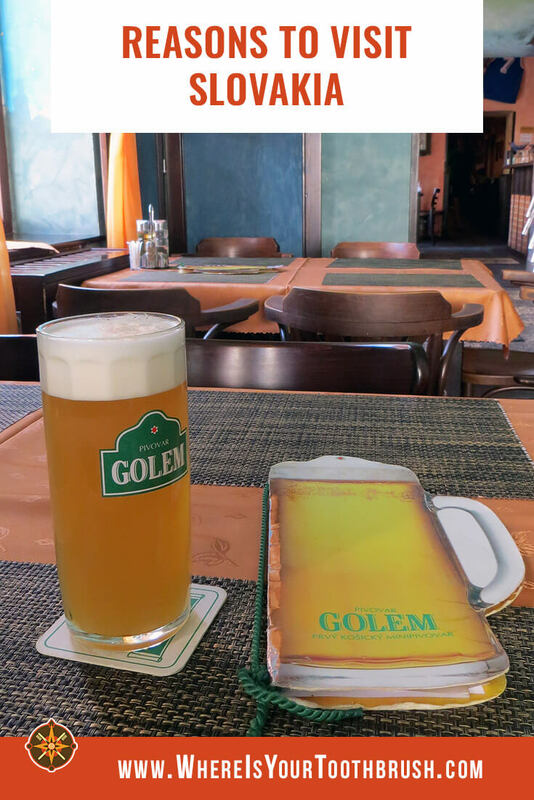 On this visit alone I discovered a dynamic art scene (see Reason #4), microbreweries (see here for microbreweries in Košice and here for craft breweries in Bratislava), and much better public transportation vehicles. In other words, visit Slovakia before it looks like any other Western country. 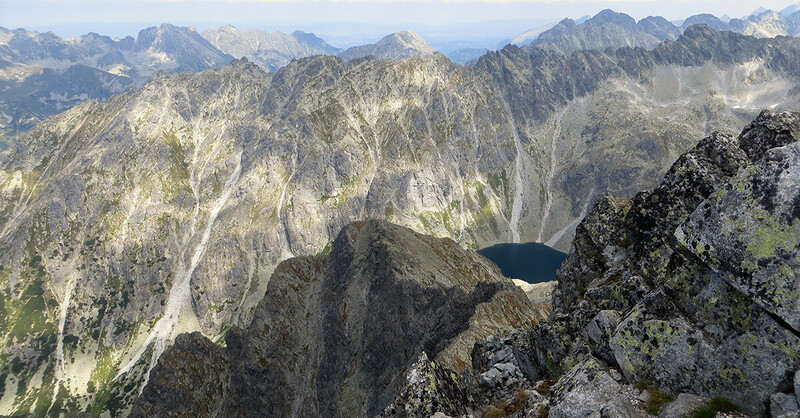 High Tatra Mountains in the summer of 2013, looking east from the top of Kriváň, 2,495 meters. 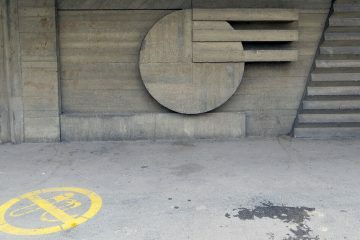 I’ll say it again: Slovakia inspires art. 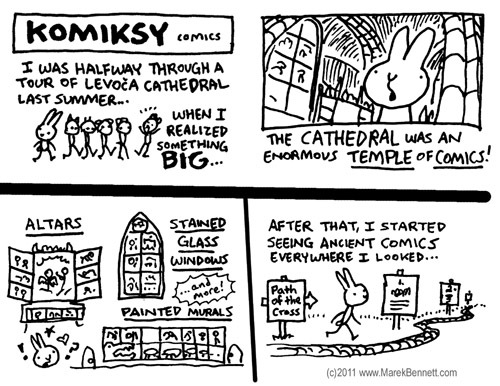 Marek Bennett documented his visit to the land of his ancestors with the Coffee+Dumpling+Komiks: One Rabbit’s Adventures in Slovakia comics and book (out now). 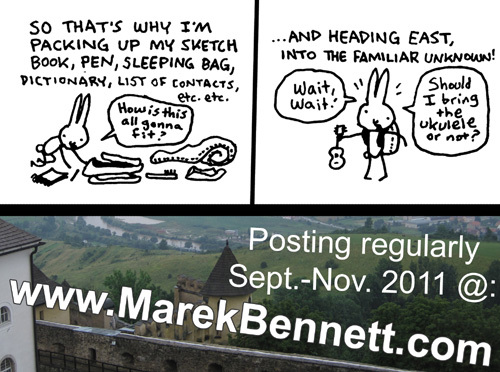 A huge thanks to Marek for the permission to repost a portion of his comics “Why Go to Slovakia?” See the entire comics and get inspired to travel in Slovakia at his website. I was glad to meet you at SAS. You don’t need to convince me to visit Slovakia. Week 4 is going fine. My relatives were most impressed with the improvement in my Slovak, grammar mistakes and all. So far we’ve only encountered one grumpy waiter – in the Koliba restaurant in Stara Lubovna, and he was a teenager. He could have been grumpy anywhere. We’ve just arrived in Kosice from Medzlicaborce. Off to see the town. Thanks for checking out the blog, Eileen! So nice to meet you and Joe at SAS. Enjoy Kosice and good luck continuing your Slovak studies! Ďakujem, Ivana. If Slovak travelers like us keep spreading the word, it’ll happen! In fact, I did see more people visiting this summer than ever before, particularly in Bratislava. I am very interested to visit Slovakia, since I have bloodlines there. My grandfather came to the U.S in the late 1800’s.Where he is from was then known as the Austro Hungarian Empire. I just recently found out he is from a town call Hrabkov in Slovakia.Oddly my DNA comes out more German than Slovak, it seems generations ago they came from the lower Rhine area of Germany. The name in Slovak is apparently Imirich, but they used Emerick.I am so anxious to get in touch with some people from the area to learn more about my ancestry and to plan a trip there. Welcome, Agnes. Good luck with your research! There’s help in Slovakia for people like you to find their ancestors. 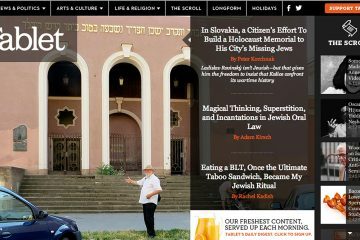 You can start with the Slovak Embassy in the US’s website. Loved reading your blog and the comics!! We are on our way to Slovakia in April and are looking forward to the spectacular nature. This will be a first visit just to get the feel of the country and maybe we will go back. We are a senior couple from South Africa and we will be travelling by car. Our first night is in Bardejov and any suggestions would be appreciated. Thanks, Jeanette. 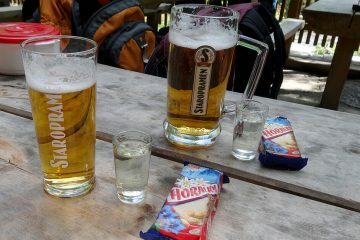 You will love Slovakia, though as a Slovak, I’m hardly unbiased. Bardejov is a beautiful medieval town and a great place to start. It’s small so you have no problems navigating it. Make sure you take a side trip to the Bardejov Spa. I don’t know what else is on your itinerary. I am from Košice and I recommend visiting there as well. The High Tatras are also a must. Otherwise, I advise patience: English isn’t widely spoken and customer service isn’t as customer friendly as it should be. A few basic phrases in Slovak should help you break the ice. Feel free to email me through the Contact page if you want specific information on any particular place or any other recommendations. Thank you Peter. We just have 5 days in Slovakia. We will be entering from Zakopane through the high Tatras and our first night is in Bardejov. Our second night is booked in Levoca. 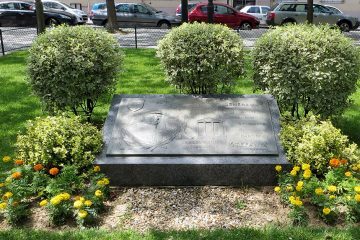 Does this trip via Kosice (St Elizabeth Cathedral) make sence or is it to far? We dont know the road conditions etc and we would really like to see the wooden churches of NE Slovakia. I then booked 2 nights in Ruzumberok to enjoy the spa experience there. We plan to drive via Banska Stavnica. The last night we are booked in Piestany but I am still a bit unsure about this. From there we are travelling to Vienna for our flight home. I am really open to any suggestions. We are not fond of big cities but love the small villages and back roads of Europe and can really appreciate the beautiful nature. I allready made a list of some words and phrases to translate in Slovak and Polish to help us out! Thanks, Jeanette. A good plan! Leave Košice for another trip, you need at least a couple of days there. I toured the wooden churches some 15 years ago. There are many to see, some open to visitors, others I had to find the person with the key. I think you shouldn’t have problems nowadays as long as you have a plan which churches you want to see and did some research. Slovak roads are less congested than Polish ones. Bardejov, Levoča, and Banská Štiavnica are all pleasant little medieval towns. I am not sure about Ružomberok as I’ve never been there mostly because I see no reason to visit. Piešťany is nice, on my list for a longer, overnight stay and a spa treatment next time I’m in the vicinity. Feel free to get in touch when you’re in Slovakia, I’d be happy to help, just know I’ll be in South America when you’re visiting my homeland, so I cannot guarantee an immediate response. Those all sound like great reasons but you had me with the first one! Few tourists is what I always look for. Funny you should say that, Suki. In the 2010 Best American Travel Writing compilation I am reading right now, Peter Jon Lindsberg writes, in the essay “In Defense of Tourism”, culled from the Travel+Leisure magazine: “we trade the proverbial hell of other people for the hell of trying in vain to avoid other people.” Slovakia could use more tourists to elevate the quality of services and the infrastructure for travelers/visitors/tourists from abroad (e.g. English speaking staff), is all I’m saying. If you ever do visit Slovakia, let me know what you think! Hah, dumplings are great, though! I’ve been over (from the UK) to visit friends on & off since 1999. I had a great time earlier this year staying in Malacky for a few days, although that’s the other side of the country from your hometown. 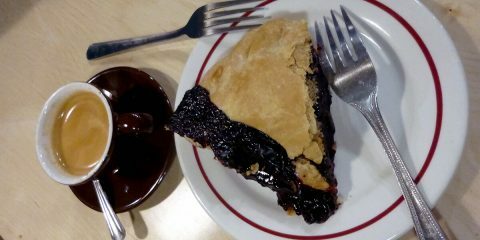 Hikes in Malé Karpaty, local beer festivals, and plenty of honest eating! Lived in Bratislava for a job for six months back in the late 1990s. My only regret is that we didn’t see a lot more of this beautiful country whilst there. Wonderful, wonderful people, just lovely, warm, kindly and interesting, burdened by awful political leaders. Truly felt like Slovakia was Europe’s best kept secret. And delicious food, far better than Czech food next door. Highly recommend the country to every traveller going to Eastern Europe. We applaud you, Slovakia, and wish you all the best. — A fan in Ireland. Thanks, Anne. Slovakia is still there, visit any time, while it’s still a secret. Okay, you’ve convinced me! I have never been but now I really want to go! 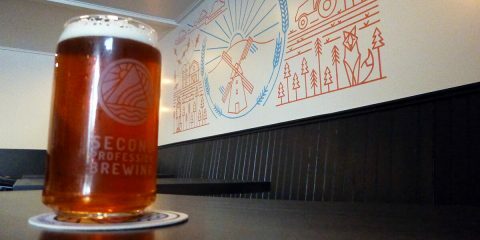 Those mountains look breathtaking, we also love a place with a great art scene! I’m really into art and architecture and I think Slovakia would tick both boxes. What an interesting and underrated country to visit! I have some close friends who visited and loved Slovakia. They aren’t travel writers or bloggers so now I can really understand why the liked it so much. Nice intro; I’ve only passed through briefly, to Bratislava, forcing myself to at least spend one night in transit on the way back to Slovenia. The high Tatra are particularly interesting to me. Is there one city or town that’s the considered the center point or best base for hiking, camping, etc? 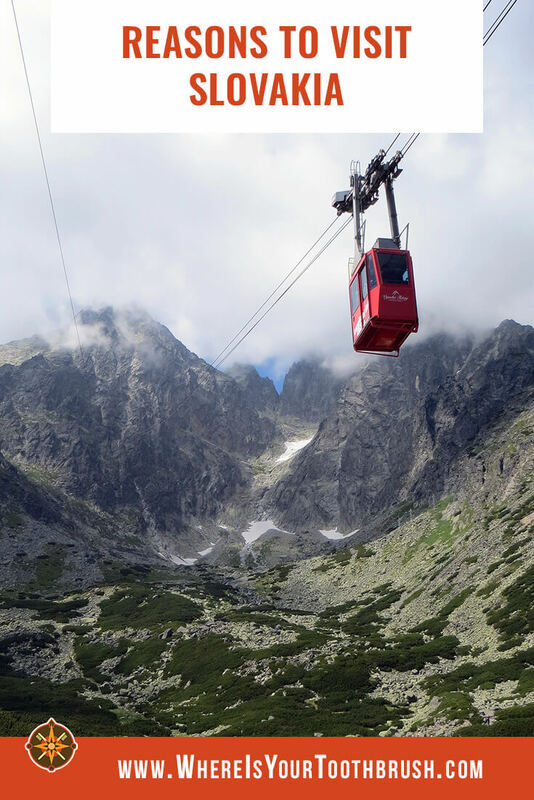 There are three little towns that provide good base for hiking in the Tatras: Štrbské Pleso for the western part, Smokovec for the central part, and Tatranská Lomnica for the eastern part. Uhh you had me at three-course dinner at 10pm. I would delighted to be in a country that offered me food 10 times a day! I would absolutely love to visit someday and meet the people, sounds charming. That’s my parents for ya. I’ve not been to Slovakia, but I always love exploring “underrated”/less touristy spots in Europe. Plus the people in Eastern Europe are some of the nicest in the world. I can’t wait to add Slovakia to the list! Underrated for sure. Just don’t tell Slovaks they’re Eastern European, unless you want to piss them off. I live in Europe and this has been on my to do list forever, but this gave me a much needed push to just go. It seems like a beautiful country with charming features. I loved your photos! I think I would want to go for the hospitable locals and few tourists! I was so charmed by Slovakia this spring and would love to discover more. We spent several days based in Kosice but wandering villages looking for and meeting distant relatives – a DNA trip. Loved the people, met only kind waiters, and the food made me miss my mother more than ever. As I’m sure Slovakia was charmed by you. Slovaks love foreigners searching for their ancestors, it feels good to be a homeland. Please, forgive my lack of history, I often confuse Slovakia and Slovenia. Every time I hear either name, my brain gets into “search” mode: Ok, processing, processing; aha, got it! Here we are talking about [put the name of the country here]. Besides the fact that it was a part of Czechoslovakia, I do not know much about Slovakia. Thus, your photos and bits and pieces of information were interesting. I find the slogan cool but, perhaps, slightly mysterious. The “little” part was obvious; the “big” needed an explanation. Thanks for the linked article. It was a great reading. It’s a common mistake, Elena, I have to deal with it here in the U.S. on a nearly daily basis. Slovakia has a new slogan now, and it’s not much better than the old one. 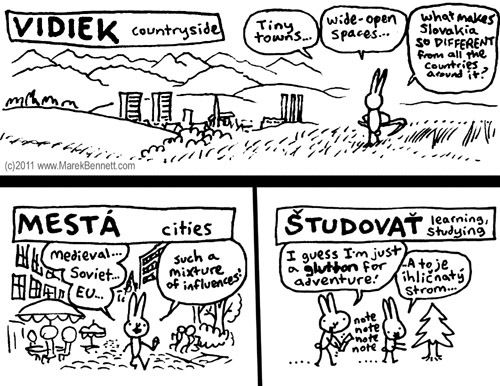 “Slovakia: Good Idea.” I mean come on. Nice, Genie. Check out http://WelcomeToBratislava.eu/ before you visit. Bring good shoes and learn the greeting in Slovak to use on the trails (“Dobrý deň”, literally “Good Day”) and you’re good to go. Thanks, Vaisakhi. Marketing can do wonders. I do want to visit it sounds great, I like the idea of being offer food 10 times a day! Although not sure about a shot on arrival and departure! I like the Big Little country slogan, it sounds friendly which from your post sounds right! 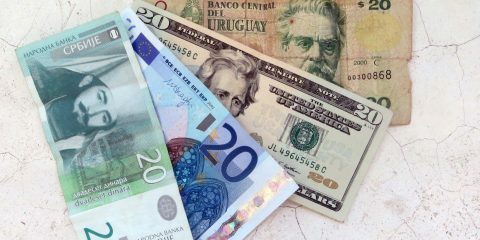 This is such an excellent post Peter, and you’ll be happy to read that I’m planning on visiting Bratislava this year! I was surprised to read about the lack of tourists; is this still the case in 2017? I definitely plan to sample a beer or 2, plus look forward to experiencing the ‘extreme hospitality’ for myself! Thanks, Lisa. Hope you enjoy Bratislava! The capital is the touristiest place in the country, most people who visit Slovakia only stop there. The rest of the country is still much less visited, which is changing only slowly. I was sold on Slovakia with your first reason itself. I like places which are less touristy. Happy to know its a very hospitable country and there’s a thriving art scene. Thanks, Archana. If I do my job well, the first reason will become obsolete soon. I have only heard good things about Slovakia being a great and holiday, and no wonder with some of they views! I’ve never considered coming to Slovakia but I certainly am now! Great read with some top tips! Thanks, David. Hope you get to visit Slovakia soon. Slovakia seems like a beautiful country to visit. The cable car must give some stunning views. “A guest in the house is a god in the house” what a lovely expression. Thanks, Marlies. It is beautiful, but not too many people know it. Or that they would be gods when visiting. Glad to find something on Slovakia. I haven’t seen too many posts on this country and I think that is a good thing as you have explained in the first point. It is a relief to still find places that do not have too many tourists swarming all over. Thanks, Jitaditya. I’m working on changing that. I am so glad I found this! We are headed to Slovakia in June 2018 and have been getting mixed feedback from a lot of people. looking more and more forward to this trip now!